Picture of an ocelli in SP65 under crossed-nicols (1mm in diameter). SP65 (Blue Hill Dike). Basalt. 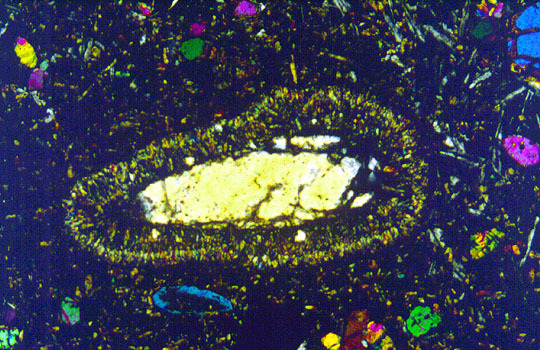 This rock is holocrystalline, porphyritic-aphanitic, with medium grained phenocrysts set in a grey-brown groundmass (30%) composed of plagioclase and potassium feldspar. All crystals are subhedral except the opaque minerals (<1 mm) and olivine which are subhedral to anhedral. The following are present as phenocryst phases: normally zoned olivine (3-5 mm); plagioclase (<1 mm); potassium feldspar(<1 mm); analcite (<1 mm); orthopyroxene (<1 mm); augite (<1 mm); apatite (<1 mm); iddingsite (.5 mm) locally replaced by fluorite. Abundant ocelli (1-1.5 mm) are present as circular to subcircular masses with quartz cores rimmed by subhedral acicular clinopyroxene crystals. Some of the olivines are rimmed with clinopyroxene.